My recent experience has made me realize that the ThreadLocal class was never really designed to be used as a non-static field. However, the implications of making it non-static are not highlighted enough in JDK API and the many ThreadLocal tutorials you find on the net. If you want to know more about ThreadLocals I would recommend reading Threading lightly by Brian Goetz. Brian talks about why and how to use ThreadLocals along with some examples. And if you are a performance buff, you will surely have an "Aha!" moment when you read the section on the performance bottleneck with the JDK 1.2 implementation and how it was resolved in JDK1.3. object can I do that? ThreadLocal to be per instance of a cached object. Prasad: Yeah .. that was my question. Would that work? there was a memory leak in the application! Running through optimizeIt and looking for non GC’ed instances we realized that the number of Context objects was more than the cache size. Likely that there was some one referring the Context even after the corresponding CachedObject had been removed from the Cache. 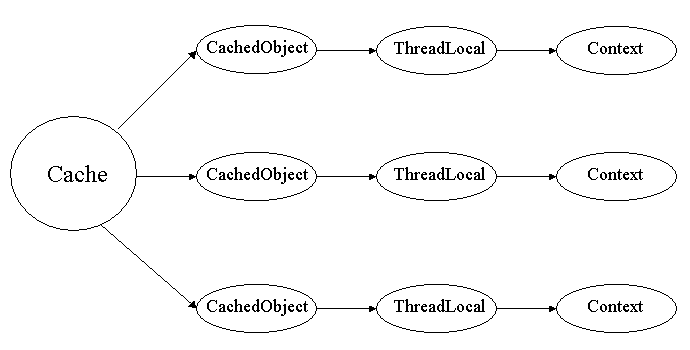 OptimizeIt’s reduced reference graph showed that the ThreadLocals were holding reference to these Context object instances. Aha! Now there were multiple places where the CachedObjects were being evicted from the Cache. We had to set the ThreadLocal to null at all these places. null in the Thread that accessed it! When we invoke ThreadLocal.set(), the ThreadLocal would add itself as the key and the Context as the value to the threadLocal map of the current Thread. [This is in JDK 1.3 and above, the implementation is slightly different in JDk1.2, but the end result is the same ... there is a memory leak!] By setting the value of the ThreadLocal to null we have made the value of the map entry null . This made the Context to be available for garbage collection. However, the threadLocal map of Thread stills holds a reference to the key, which in our case is the ThreadLocal. We actually need to remove the ThreadLocal and not just set its value to null. If you are having trouble following this consider opening ThreadLocal.java and Thread.java from <jdk_1.3++_home>/src.zip and stepping through ThreadLocal.set and ThreadLocal.get methods. 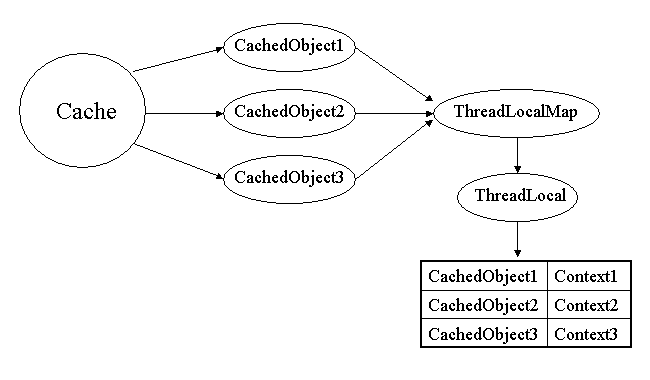 The memory leak was aggravated in this scenario because the web container reuses threads across requests and the cache objects keep getting created and garbage collected. However, the ThreadLocals don’t get GC’ed. performance issues?! … or ThreadLocal was just not designed for non-static usage?? has been added to ThreadLocal‘s API to complete its lifecycle management. Users can call the remove method and avoid such memory leaks. But for most of us who can’t make JDK 1.5 as the minimum requirement for our application we have to find some other way out. I have posted an update to this after receiving some feedback. Great! Thanks for pointing out a potential application killer, and insight into the ThreadLocal lifecycle. I found similar issue in a team code review long before, and I believe Sun should change the Thread class to hold the ThreadLocal instances with a WeakHashMap.